Ask Patents is a question and answer site for people interested in improving and participating in the US patent system. It's built and run by you as part of the Stack Exchange network of Q&A sites. With your help, we're working together to find Prior Art on dangerous and overly broad US Patent Applications before they become issued Patents. Some users help by identifying dangerous patent applications. Other users help by finding Prior Art related to dangerous patent applications. Ask Patents blocks dangerous applications by alerting the US Patent Examiner of record when good Prior Art is found for an application that he or she is examining. 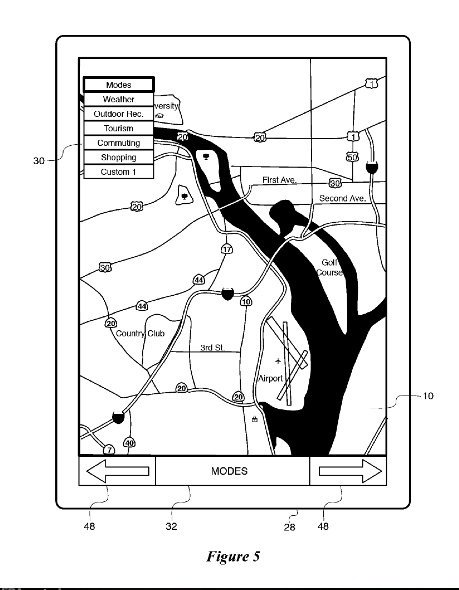 Apple recently filed for an "Interactive Map" patent that in every way resembles a collection of technologies and methods known as "Geographic Information Systems" (GIS). 10 minutes of your time can help narrow US patent applications before they become patents. Follow @askpatents on twitter to help. Enhancing the value of at least one display parameter for map features of each displayed layer that are associated with the selected mode, relative to a default value for the display parameter. Likely innovators/publishers(manuals...)/patentees in this vein include Esri, Pitney Bowes and Google. Please help find prior art from June 5th 2012 or earlier. Prior art can be any publication (webpage, user manual, paper, book, youtube video, patent pre-grant publication) or patent. It is helpful to establish a date when the prior art was available to the public and a solid reference which can be cited by the USPTO. A citable reference can often be found in a contemporaneous publication about the technology in magazine, blog, or scientific article. Another place to look is The Wayback Machine. Let's help inform the USPTO! I have been a GIS professional since 1969. I helped design and program two major GIS software packages. The first was a system called MOSS (Map Overlay and Statistical System). This fully interactive GIS package was deployed in 1978. MOSS had a command line interface that allowed the user to select map layers of interest (including attribute filters) and control the display of these layers at run time. MOSS was in the public domain and is recognized as the first open source GIS project. Therefore, all MOSS capabilities could be consider as prior art. I have copies of user manuals, design documents, and so forth. These documents are also in the public domain. Prior Art on a dangerous US Patent Application that you have identified.